Your skin is capable of regenerating every 27 days, according to the Cleveland Clinic. In most cases, proper cleansing along with a well-balanced diet and plenty of water will help your skin rejuvenate naturally. But when your skin needs some extra TLC -- for example, when it’s undergone trauma, like a burn or wound, or when it has suffered damage from the sun -- certain vitamins may facilitate the regeneration process. Talk to your doctor about using vitamins for specific skin conditions. An antioxidant, vitamin C plays a major role in the manufacture of collagen, a protein that helps your skin renew itself. This nutrient protects against ultraviolet damage from the sun and decreases wrinkles caused by the aging process. In addition, deficiency in vitamin C can lead to poor wound healing or dry, scaly skin. Women should get at least 75 milligrams a day, while men need a minimum of 90 milligrams. Good sources of vitamin C in the diet include citrus fruits, kiwi, strawberries, mangoes, broccoli, tomatoes, sweet potatoes and winter squash. Vitamin E is the most abundant antioxidant in your skin, especially the outer layer, called the epidermis. This nutrient plays a role in protecting your skin from UV damage, which can decrease the amount of vitamin E in the skin, reports Linus Pauling Institute, but research on dietary supplementation has been mixed. However, a study published in “The Journal of Investigative Dermatology” in 2005 found that supplementation with both vitamin C and vitamin E for three months protected against the type of DNA damage caused by sunburn. Adults need at least 15 milligrams of vitamin E daily, found in foods such as nuts, seeds, vegetable oils and leafy greens. Another antioxidant, vitamin A, helps in the generation of healthy skin cells. Supplementation with vitamin A can promote proper wound healing and the formation of healthy scar tissue. Vitamin A supplements have also been used for a wide range of skin problems, including acne, burns and UV damage. However, the National Institutes of Health notes that the scientific evidence for its use in these conditions is still lacking. Women need a minimum of 700 micrograms of vitamin A per day, while men require 900 micrograms. Animal sources of vitamin A include eggs, meat, dairy, liver and fish oil. Bright orange and yellow fruits and vegetables as well as dark leafy greens are the best plant sources. Several members of the B-complex family of vitamins are instrumental in promoting the healing of pressure ulcers, according to Rosalyn Tarrant, a senior clinical nutritionist writing on the Irish Nurses and Midwives website. 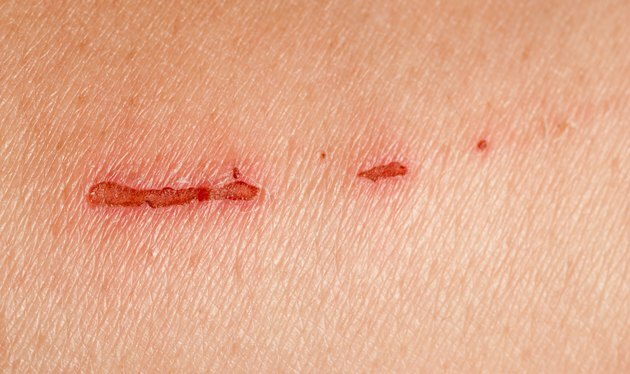 In particular, Tarrant cites thiamine, riboflavin, pantothenic acid and pyridoxine for their wound-healing properties among hospital patients at high risk for skin sores. Every day, adults need at least 1.1 to 1.3 milligrams of thiamine, 1.1 to 1.3 milligrams of riboflavin, 5 milligrams of pantothenic acid and 1.3 milligrams of pyridoxine. A variety of plant and animal foods supply B vitamins, so following a balanced diet will likely cover your daily needs.